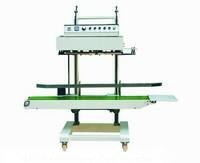 New QLF-1680 Automatic Vertical Film Sealing Machine. This unit is suitable for all kinds of sealing materials. Comes with Adjustable Speed Control for the conveyor, Adjustable Temperature Controls (Range 1 – 300 C) and a Steel Wheel Embosser. Unit has a working speed of up to 13 meters (42’) per minute. Maximum Bag Height: 800 mm (32”). Maximum Load: 15 kgs (33 lbs). Electrics: 110Volts/1Ph/60Hz. Overall Dims: 1700 x 750 x 600mm (68” x 30” x 24”) Delivery Time: 3-4 weeks from receipt of 65% deposit.